It is Apple’s consumer and business gateway to the company’s music, movie, TV show, book, audiobook, educational content (iTunes U) and app stores. However, more than a few people rather hate the app and its growing bloat, but the Cupertino kids aim to reset the relationship with the release of iTunes 11, which is due in late October. Here’s your heads up on what’s new. With 450 million accounts tied to credit card numbers, iTunes is perhaps the world’s most commercially important if not best loved app ever. That said, iTunes 11 (clip below the fold) is a highly ambitious rewrite of Apple’s jukebox, media warehouse, device manager and store application. Although all of that functionality is still housed under one roof, the company is hoping a dramatically simplified user interface and new features can bring back that loving feeling users once had for iTunes. Dramatically simplified UI — Less reliance on clickable lists by delivering a much more graphically dense UI that puts track, album, artist and extended content (see image above) right at your fingertips. — One thing users are sure to love is the ability to view their entire music [sic] collection and an editable playlist in a single window — no more clumsily flipping between a playlist and the library, which is both irritating and inefficient. 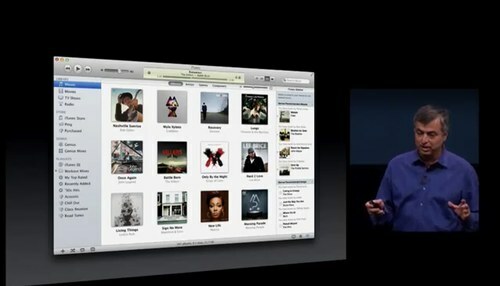 iCloud built-in — Whatever you purchase on the iTunes store is available on all of your devices via iCloud. If you pony up for iTunes Match, all of your music, whether purchased on iTunes or acquired by other means (up to 25K songs), gets stored in iCloud and is available to you on all of your iThings. New mini player — The old mini player sucked. The new mini player looks more functional and, well, less sucky. Up next — What song is next in your playlist? With iTunes 11, now you know. Moreover, you can access the currently playing list and edit it on-the-fly. Nice. 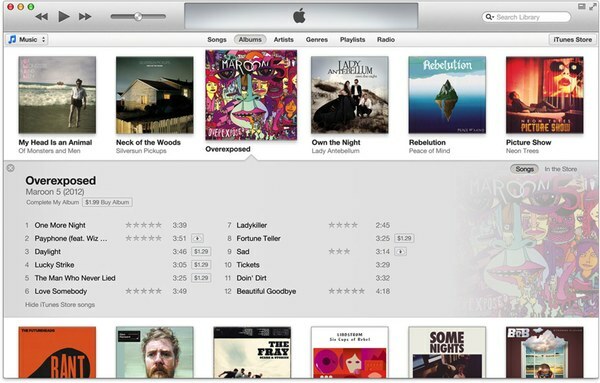 Redesigned iTunes stores — The same dramatically simplified user interface is apparent in the stores, too. You will see featured items across the top a la Cover Flow with new/hot items directly under that and packed below that a whole bunch of stuff. Requirements: Apple hasn’t published minimum system requirements, though OS X 10.6.8 (Mac) and Windows Vista (PC) seem the likely jumping off points. Whereas Apple’s onstage iTunes demo went off without a hitch, a key element about this reboot is how well it will perform in the real world. Further, if iTunes 11 destroys even a tiny number of user music, movie, TV show, book, audiobook and app libraries, which can easily weigh tens of gigabytes, then Apple will have a serious PR problem on its hands. Do you plan to adopt iTunes 11 on the day it ships or will let other suckers people try it out first?